A really, really long time ago, making perfect pancakes completely from scratch was one the first real cooking goals I ever set for myself. To be more exact, I had set a general learning goal to make as many things as possible from scratch, and I thought I was starting small with pancakes. Well, after several unsuccessful batches of homemade pancake batter, I can tell you that as a novice cook all those years ago I completely underestimated the "simple" pancake. Word for word, I followed the directions in pancake recipes that I found in old recipe card sets and cookbooks I had, and without fail the pancakes were disappointing. It was a different sort of failure for each and every batch, but basically they turned out flat, tough or just completely flavorless. I didn't understand it. There was no way all of those recipes were that flawed. They were published by big names in the cookbook industry and surely someone had put them through a quality test, right? So, logic forced me to admit that the problem was most likely a classic case of user error. But, since I had followed the steps in the recipes to a "T", I just wasn't really sure how I was screwing it up. After a few more weeks of pancake disasters, I decided to try making homemade sandwich bread to break the monotony. (Reach for the stars, right? Why not!) When I began researching bread recipes and bread-making techniques on the internet, I came across an article about gluten, bread-making and proper kneading. Reading that information was nearly life-altering for me. Seriously, after reading that enormously useful article, I realized that my problem with pancakes came down to over-mixing the batter. Yep, I was a serial pancake batter over-mixer and I was definitely the one killing the Sunday morning pancakes! In a nutshell, what I learned was that, like cake batter, pancake batter has to be handled gently so that gluten doesn't over-develop in the mixing process. That way the gluten in the batter can trap more air that's created during the cooking process and cause the pancake rise with a soft, fluffy texture. It was learning to correct my mistakes in making successful, simple pancakes that proved to me that there truly is a lot of science and conscious technique involved in cooking and baking. This realization made me more daring when it came to trying new methods in the kitchen, but now I do my research first. So, I'm happy to pass on the fruits of my labor to you. 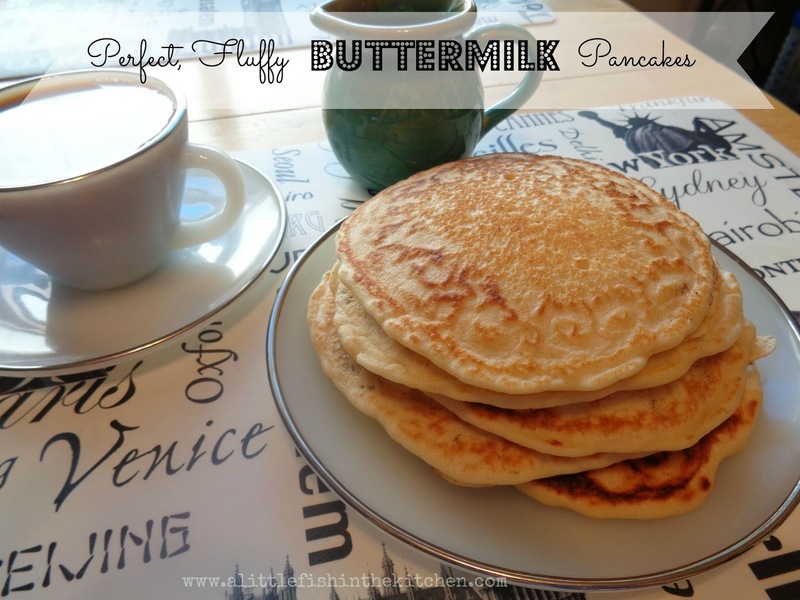 This is the only basic buttermilk pancake recipe I ever use anymore. And for the love of Pete, just take it easy when you're mixing up the batter! 1. Mix all dry ingredients together in a large bowl and set aside. 2. In a large measuring cup or a small bowl, mix the beaten egg, melted butter and vanilla together with the buttermilk. Make a well in the center of the dry ingredients and pour buttermilk mixture into the well. Using a wooden spoon, mix all ingredients until the batter is just mixed. (No longer than about 45 seconds!) The batter will be lumpy. 3. Heat a griddle or a skillet to medium heat. (Note: even with a non-stick pan, I think it's a good practice to grease the surface with a light spray of non-stick cooking spray before pouring each pancake onto the heated pan. Better safe than sorry, I always say!) 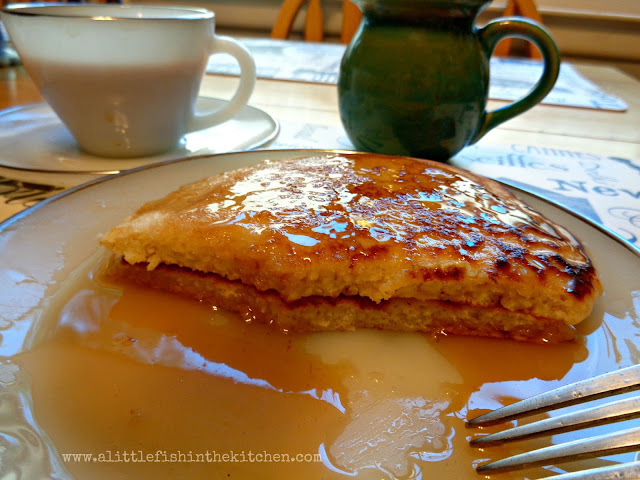 Using a 1/3 cup size measuring cup, pour individual pancakes into the heated pan. 4. Once the wet side begins to bubble up slightly, you are almost ready to flip the pancake. When those bubbles begin to burst on their own, use a spatula to carefully flip the pancake. Allow to cook for about 1 - 2 minutes and remove from the pan. Recipe should yield about ten four-inch pancakes. 5. Serve, top with your favorite pancake toppings and enjoy! Isn't science wonderful, Marcelle? I remember learning that about cakes from a middle school teacher, not my mother. My mom's were perfect, but she never knew why. Love the pancakes... wish it were Sunday morning instead of Sunday evening! Next weekend! Love pancakes! And it took me a bit of time to learn that more mixing made worse pancakes! Yours look great -- thanks.